DC’s Newest Breakfast Food: B-Holes. Really. It stands for bagel holes. Get your mind out of the gutter. Then a year and a half ago, Sarvis saw a company selling bagel holes on Shark Tank. “I was like, ‘Oh my God, no! I should have went with it,'” he says. Sarvis and his girlfriend Julia Greenberger, who works in economic consulting, launched B-Holes two months ago out of food incubator Mess Hall. They sell their b-holes at the Saturday farmers market in Petworth and other temporary locations around the city. Now through August, you can find B-Holes at (no joke) Prego Again, a beer/wine store and deli located at 1617 17th Street, Northwest, where they’ll vend on the patio on Friday and Sunday mornings. They’re also at Prequel in Penn Quarter on Friday mornings, and available via Postmates delivery on Fridays and Sundays. 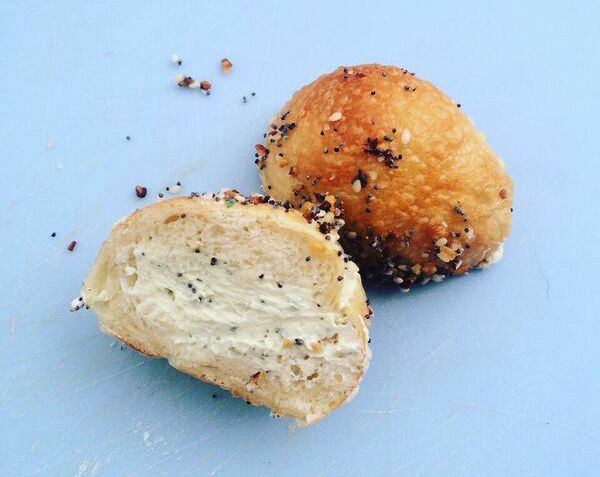 B-Holes currently serves four flavors: cinnamon treat (Cinnamon Toast Crunch is baked into the dough), “barlic gacon” (bacon and roasted garlic cream cheese inside, pepper jack on top), original (chive, onion, and dill cream cheese inside, everything bagel seeds on top), and the Mrs. Lavender (honey lavender filling with a sweet frosting drizzle). Each b-hole is $2. You can also get iced coffee. Sarvis is looking to get his product in local coffee shops and also build-up their catering operation. A retail shop isn’t in the works for the foreseeable future.